Suparest Backrest Supports The Spine And Lower Back. Our Suparest backrest supports the spine and lower back encouraging correct posture. 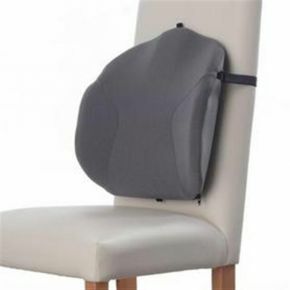 Its shaped sides hold the overtaxed lateral muscles, giving double the support of any ordinary lumbar cushion. The Superest is covered in finest velour and lightweight with adjustable fixing strap. "I have suffered with a lower back problem for some years, I purchased my first " Superest", it was not long before I realised this was like a gift from heaven a fantastic product. Like most things in life, I took it for granted, and then I received a brand new car with leather sports seats. I gave my old car along with the " Superest" to my wife. After driving my new car for literally only a day or so, I suddenly realised my back pain had returned during and after each journey. It was then I realised how important my " Superest" was, but guess what? My wife would not hand over my " Superest" as it made her more comfortable and stopped her slouching. I immediately ordered a second " Superest" from you; I felt I must write to thank you."